Imrul Kayes and Co registered their first victory against Rangpur Riders after two defeats in the league stage. 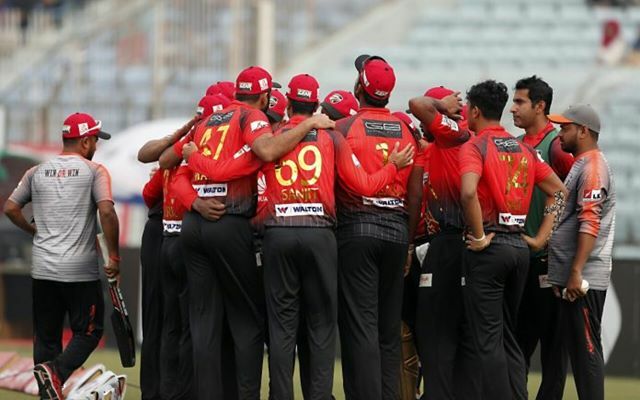 Comilla Victorians were one of the most dominant teams in the round-robin stage of this year’s Bangladesh Premier League and they are in the final of the T20 tournament. The Imrul Kayes-captained team defeated defending champions Rangpur Riders by six wickets at the Sher-E-Bangla National Stadium. It also means that the Riders would now face Dhaka Dynamites in the second qualifier. The Riders made a slow, but steady start after winning the toss and electing to bat first. Mehedi Maruf and Mohammad Mithun perished early, but Chris Gayle blended caution with aggression and scored 46 runs at a tad over a run-a-ball with six fours and an over-boundary. Gayle rode his luck a couple of times and was eventually dismissed by tweaker Mahedi Hasan. Ravi Bopara fell prey to off-spinner Sanjit Saha. Thereafter, Rilee Russouw and Benny Howell, who replaced AB de Villiers, took charge and cobbled together a stand of 70 runs off 40 balls. Russouw notched 44 runs in 31 balls with four fours and two sixes. Mohammad Saifuddin got rid of the South African in the 19th over. Howell went on to rack up a sparkling half-century and remained not out on 53 runs from 28 balls. The Riders scored 165 in 20 overs. Tamim Iqbal and Evin Lewis gave the Victorians a decent start with a 35-run stand in 29 balls. Mashrafe Mortaza struck first blood and got rid of Tamim after the left-hander scored 17 with a four and six apiece. Anamul Haque and Evin Lewis then took charge and put together a priceless partnership of 90 runs to put Comilla on the driver’s seat. Shafiul Islam castled Anamul for 39 to separate the duo. At the other end, Lewis struggled with his hamstring, yet carried on with his knock without any complaints and he remained not out on 71 runs from 53 balls with five fours and three sixes. With 25 runs required from the last three overs, Shamsur Rahman went hammer and tongs to race away to 34 runs from 15 balls with four boundaries and two sixes. The Victorians won with seven balls to spare. Benny Howell just puts a ABD prototype show! Benny Howell is under rated among t20 leagues. Bats decent,bowls decent. R Riders were 91 for 4 at the end of 15 overs but 74 runs from last 5 overs, Benny Howell's 28-ball 53 not out, steered them to165 for 5.Rossouw didn't get his timing right but some sloppy fielding meant he also scored 31-ball 44 as C Victorians lost their way in the death overs. Evin Lewis is running a lot of singles today,something he didn't do in the IPL last season.